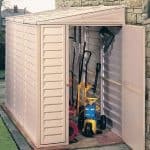 It’s easy to see why more and more people are turning to plastic buildings when they want an affordable garage or a large garden structure. 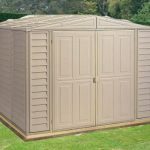 This ivory coloured PVC garage is a great example, as it offers a wide range of benefits when compared to timber or metal buildings, and yet it still provides the traditional look of a large apex shed meaning that it won’t look out of place in any garden environment. 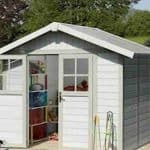 The PVC cladding is arranged in a shiplap style, which is not only a classic style it’s also very effective at keeping rain or snow out. The apex roof itself also aids this function, as it causes precipitation to simply slide away. 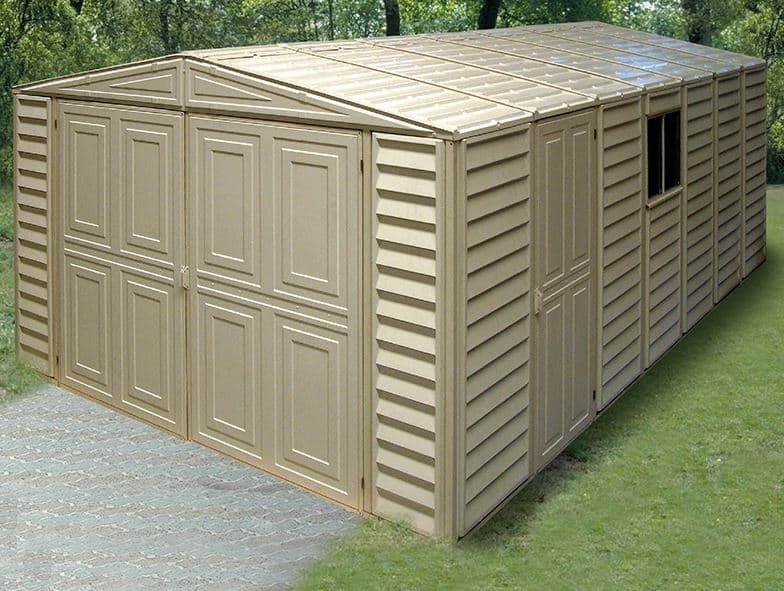 Being made from PVC, the garage is also very tough and durable, and is covered by a 10 year warranty. Whilst we appreciate that this gives the customer peace of mind, we feel it could and should be even longer. When inside the garage, you’ll find that it’s a comfortable and pleasant environment to spend time in. That’s thanks to an infusion of natural light provided by a side window and a built in skylight. Fresh air is also supplied through integral vents, which is a useful feature on warmer days. This large plastic building with an apex roof may be marketed as a garage, but its size and relative affordability makes it a very versatile structure. We can easily imagine it being used as a large scale garden shed, perhaps for a shared or community garden, or even as a workshop for use with a hobby or business. Despite being made of PVC we found its looks elegant and stylish, thanks to its ivory colouration and traditional styling. One of the first things we noticed was just how tall it is. The apex roof gives a lot of headroom, which means there are no problems moving around or getting in or out of a car. The peak height of the garage is 2.17m and the eaves height is 1.86m, which is just over six feet tall. The overall width is 3.22m and the overall depth is 5.59, neither of these measurements including the overhang. All of the cladding is made of the same ivory PVC, which we welcomed as it’s very tough and durable. What makes the building particularly stable and reliable is that it’s based upon a galvanised steel frame. We were pleased to see this used, as it’s very moisture resistant, light and easy to assemble, and yet very solid when constructed. 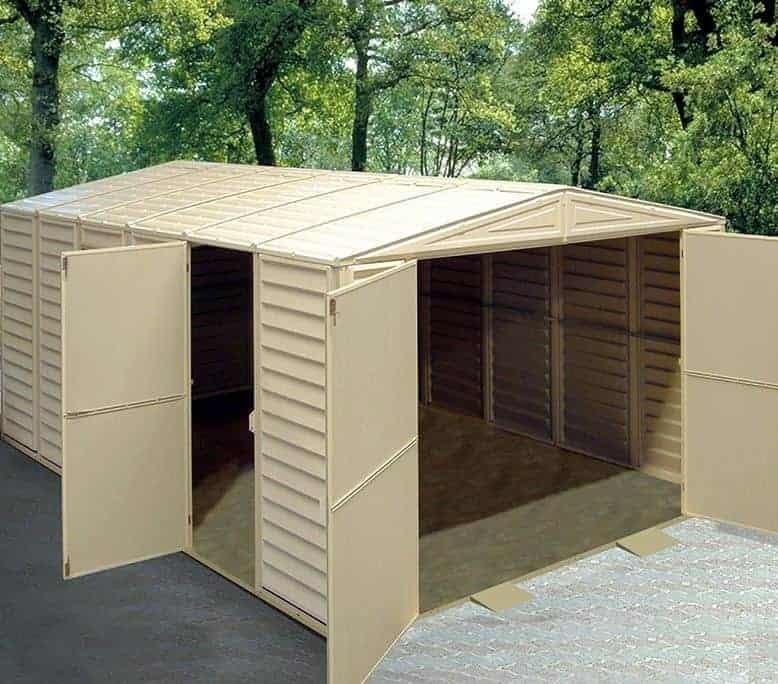 There is no floor supplied with this garage, as it’s designed to be affixed directly onto a level concrete area measuring at least 3.22 X 5.59m. We were pleased to see that a steel foundation kit is included, which means that if you don’t already have a suitably level area it’s quick and easy to construct one. PVC is an extremely tough material, and is therefore not prone to rot, rust, damp, or rodent attack. For these reasons we would have expected to see a very long warranty period supplied, but in fact Duramax have only provided a 10 year warranty. We would have liked this to have been twice as long, even though we feel the build quality means that in all likelihood it won’t be called upon. Whether it’s going to be used as a garage or workshop, it’s essential to have a generously sized doorway. That’s why we were pleased to see that the double doors opened outward to a width of 2.24m and had a height of 1.80m. This means that you can easily manoeuvre vehicles of most sizes into the interior. As well as the large main door, there’s also a handy personnel door at the side, and at the same height there’s no need to bend down when using it. It was good to see that one side window had been included and that it contained acrylic glazing. That means that it’s very tough and shatter-resistant. As there’s also an integrated skylight in the centre of the roof, this means that the garage as a whole is flooded with natural light during the day, which is one of the reasons that this could be used as a workshop, particularly as there’s also built in ventilation. Whilst we were pleased to see that the windows had been made with security in mind, thanks to the tough glazing, it’ s a pity that the same can’t be said of the doors. They’re lockable from the inside but not the outside, so although the handles are ready to accept a padlock this will have to be sourced separately by the owner. For a building of this price, and one that is designed to hold valuable objects such as motor vehicles, we feel this is a real oversight. As explained above, one optional extra that we would definitely recommend buying is a padlock and also an alarm system. If motor vehicles are being kept inside, then it may also be worth investing in a CCTV system as the sight of these alone can be a very effective deterrent against opportune thieves. These needn’t be expensive purchases, but unfortunately they will have to be sourced separately as they are not available to be bought alongside the garage itself. Indeed, the lack of any customisation options is a pity, although in a way it goes to show how much is already included with the standard package. Some people have a false perception of PVC and vinyl as a substrate, but in fact it’s a strong and high quality material, as we found here. There is no shelving material that’s as durable as high quality PVC such as this. Without any need for painting or preserving, you won’t need to worry about rot or rust. 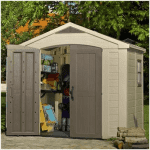 This is a very large storage area, and the wide opening doors make it ideal for single car usage or as a spacious workshop. You’ll require a friend’s help, or possibly two, to install this garage. The instructions are straightforward, but even so it can take around 14 to 16 hours, so put aside two days for the job. We would have liked to see a longer warranty period and a secure locking system, but even without these this still represents good value for money for such a large and durable building. 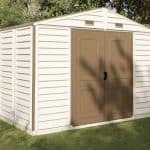 Final Thoughts: If you thought that garages had to be made out of brick or stone and come with a prohibitive price attached, then this PVC garage from Duramax can make you think again. We like the ivory PVC look, and this garden building shows that it can work on a grand scale rather than simply being used for fascias and soffits. What we like most about the substrate is that it’s very weather resistant, so you won’t have to worry about it rotting or rusting, and whatever you keep inside is sure to remain dry. With no treatments required, the only additional thing you’ll really need to do is add a padlock and alarm.